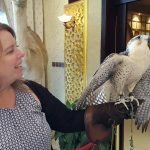 If you’ve recently moved to Abu Dhabi you’ll quickly become familiar with images of falcons – they’re the national bird of the United Arab Emirates and a symbol of force and courage. 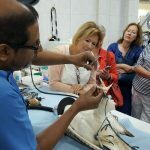 On 7th March AWN Explorers event visited the Falcon Hospital in Abu Dhabi to see first-hand the work of this unique veterinary centre. 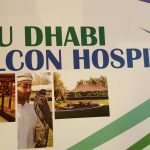 Established in October 1999, it is the largest Falcon Hospital in the world. Greeted by Denis, our entertaining and knowledgeable guide, he shared the fascinating history of falconry in the Arabian Peninsular and explained the differences in speed, strength and characteristics of the three most commonly used species in the region. 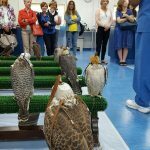 We learned that this award winning institution has grown rapidly since it’s inception, providing an array of veterinary services falcons and other birds and they’re incredibly busy, receiving some 11,000 plus a year. In 2007 the hospital opened a Pet Care Centre complete with dog and cat ‘hotel’, small animal hospital and a dog agility park – the canine equivalent to a work out! They have an animal shelter and a humane neutering programme that helps to manage the number of stray cats in our communities. 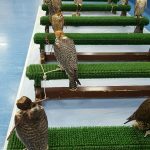 The centre has developed an exclusive passport system for falcons which helps to combat illegal practices; they also have a Falcon Release Programme through which birds are released back into the wild. 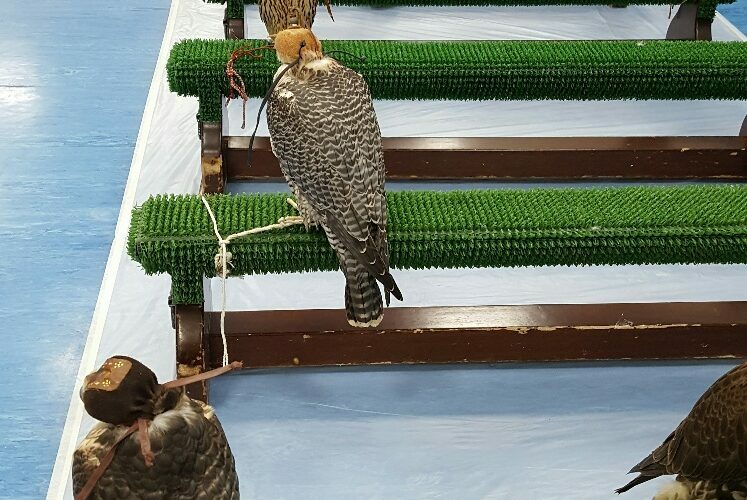 Educated and highly impressed, we moved to a room where we were greeted by the surprising sight of over 20 falcons; each hooded, perched and awaiting treatment. Anyone who has taken a beloved pet to the vets will be familiar with the noise and occasional chaos of the waiting room. In contrast, this room was a sea of calm – the birds apparently at ease and unperturbed. 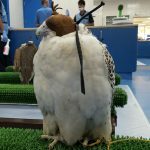 Here we were privileged to see a falcon sedated and watched at incredibly close quarters the grooming of it’s talons and beak. Some of our group were we’re even allowed to gently touch the falcon and feel it’s beating heart. I was thrilled to be in such close proximity to falcons during our visit and as we stood in one of the ‘moulting facilities’ it was quite something to feel the strength of the downdraft from a free flying falcon circling overhead. Finally, before an abundant and delicious lunch, those who wished to were given the opportunity to don a glove and hold one of these striking creatures. A huge thank you to Denis and colleagues for their warm hospitality and sharing their inspiring work.